We invite you to explore India - the Land with infinite beauty ! Whether you soar high into Himalayas or peer under the ruins of the Ancient monuments dotting the landscape of India, you will cherish the experience long after your visit ! This India Travel Guide on Hemis Gompa is free from any commercial interest! This site is dedicated to promote India - the vast subcontinent, its glorious past, magnificent landscape and its infinite variety. Also known as Chang Chub Sam Ling or 'the lone place of the compassionate person', Hemis Gompa was founded about 350 years ago and it is one of the wealthiest monasteries in Ladakh. Established by Lama Tagstang Raspa and built by Palden Sara under the patronage of King Sengge Namgyal, Hemis Gompa is built on a site believed to have been sanctified by the construction of a cave hermitage as early as the 12th century. Hemis Gompa is situated south of Leh, on the south bank of the river Indus, in the state of Jammu and Kashmir at an awesome altitude of 12,000 feet. This makes Hemis one of the highest settlements of the world. Surrounded by mountain rocks, Hemis Gompa is a beautiful and grand monastery for the Buddhists. 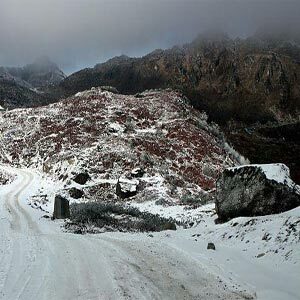 It is hidden inside the Hemis national park and is positioned inside a gorge, a distance of approximately 47 km from Leh. Hemis belongs to the Kagupa Brugpa sect of Buddhism. This sect was largely found in Bhutan. The Gompa is a unique example of a monastic complex of this period which manifests in its structure the 'geomantic principles' that underlies such religious type constructions. The main building dates back to 1630. The Nyingma Lhakhang was constructed with a courtyard in front and the residence for the Rinpoche at some distance in the east. It was during the 17th-18th centuries that the main Gompa reached its zenith with the construction of the Dukhang Chenmo, - the assembly hall and its adjacent building, the main entrance to the Gompa building and a large courtyard. A gallery decorated with painted stone reliefs lent additional charm to the Gompa. Architecturally, the Hemis Gompa mountain complex is unique. It is not only conceptualized and constructed as a three dimensional mandala, but also boasts of intrinsic design qualities complemented with 17th century murals in a variety of pigments and gold paint that makes it truly rare. The monastery has a rich collection of ancient relics which are displayed in a stunning array inside. A copper-gilt statue of Lord Buddha, stupas in gold and silver, sacred thankas, and other exquisite objects can be found here. On a slightly higher plane to the Hemis Gompa in Leh Ladakh is a sacred hermitage found by Gyalwa Kotsang. Here in the meditation cave of Gyalwa, you can find his footprints and handprints on the rock and sacred shrines. A two-day annual festival known as the Hemis festival is another hallmark of Hemis Gompa. The festival is a commemoration of the birth anniversary of Guru Padmasambhava. During the Hemis festival, the thanka, which is a sacred appliqué work tapestry wrought with pearls, which depicts Guru Padmasambhava is revealed; once every twelve years. Guru Padmasambhava, also known as Guru Rimpoche, founded Tantric Buddhism and he is acknowledged as the founder of Buddhism in Tibet. Popularly known as Tse Shoe, Hemis Gompa is the name of this festive occasion and it is celebrated at different places year on year. The Cham dances are the main attraction of this Hemis festival. Sacred mask dance is performed every year at the monastery. The dance takes place on the 9th and 10th day of the fifth month of the Tibetan calendar. It is a re-enactment of the magical feats performed by Padmasambhava, in eight different manifestations. The dance is performed to the accompaniment of discordant brass trumphet sounds and long horns. The lamas or monks are transformed into demons and gods. And devotees show their respect to the portrait of their sacred Guru Rimpoche. Another very interesting aspect of the Hemis festival is that it knits families of Ladakhis together, with their ornate festival clothing, very native Tibetan. No wonder then, other that Buddha Purnima im Hemis Gompa, is considered as the most auspicious festivals for the Buddhist community in India and across the world.